GH tract I mentioned is at San Jose and Yarmouth. cool. thank you! I will go by there soon. "These luxurious, contemporary 'Living-Conditioned' homes have special appeal to the discriminating family. 'Living-Conditioned' homes are conditioned for space, sound, color, light, climate and safety, which means more comfort, convenience and livability for your family in the years ahead. 18 designs of 3 and 4 bedrooms, all with family room, 2 baths and Electri-living kitchen on estate-size lots." I forgot that it was actually Sanford D. Adler who was the developer, not Alexander. 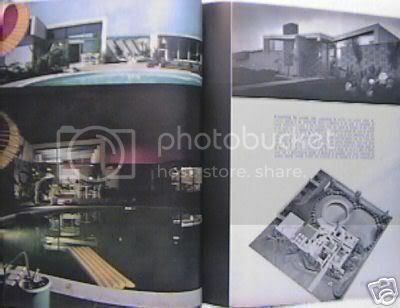 Of course, the similarity of these homes to those developed by Alexander is the architectural firm of Palmer & Krisel. At the recent Valley Home tour, I met Bill Krisel, as well as owners of one these homes and he said he had driven through the tract and "there wasn't one left worth taking a photo of." I think he didn't look hard enough. Originally, there were plans to build many more of these homes in the tract, but sadly, that did not happen. At the time, you could also commission Sanford D. Adler to build a "Living-Conditioned" home on your own vacant lot. everyone is most familiar with the tract that is right off reseda and devonshire. BUT a little known fact is that there are a few more of these home tracts tucked in a couple of other nearby neighborhoods - i remember one being a mile or so east, another south of it and yet another one southeast of that hood. Highview Ave. south of E Altadena Drive. I did'nt know these existed. Thanks, Craig, for the extra info. I can only imagine how Bill Krisel must feel when he looks at what has become of so many of his homes over the years, especially now that so many people suddenly feel they have to put Roman columns and tile roofs on every surface they touch. When I met him last October as well, he seemed to evade a similar sentiment to the one you mentioned: so much of what he did has been slowly and deliberately undone. That, by the way, is precisely why I decided not to apply to architecture school. I would just be irate at the idea of somebody deciding they could re-design my building better than I did and destroying the spirit of what I created in the process. I seem to recall that there are quite a few examples of homes (the one I linked to clearly not being one of them!) in that neighborhood that are still quite original--at least from the outside. I just came across this photo, which I am pretty sure (though I'd have to drive by to verify) is one of the original "Living Conditioned" models (though the only one in the Reseda/Devonshire area that looks the same is sans pool). I do recall seeing some of the P&K homes elsewhere around Northridge, but that was when I had just moved to the Valley and didn't know my way around well enough to remember how to find them again. Perhaps on one of my free weekends I'll take a spin and see if I can find 'em again. Thank you, everyone for all the help. I am getting my directions together and going on my own little tour today. If anyone has streets or address for those I would be very grateful. Just to post a follow up. I went on my tour of the Valley. I visited Woodland West, Carbellero, Corbin Palms, Eastwood Estates, Granada Hills, Knollwood, Balboa Highlands, Meadowlark and Northridge. I did not make it to Laurelwood, Sherman Oaks or Encino, but they are probably out of our price range. I still would like to look around in Altadena. It was amazing day. I can't wait to find our dream house. Thank you so much for everyone's help. If you see an un-"updated" mid century that is for sale, please be sure to post it on the boards. Picking up on the great work Streinan has done on the topic -- if anyone is interested in Woodland West, Deauville or the other great MCM neighborhoods designed by Charles Du Bois, please feel free to check out the following two groups! The discussion is alive and well and growing by the day!